Whether you refer to it as “soda,” “pop,” or “Coke,” soft drink consumption has reached an all-time high in the U.S. While different regions the country all have their own unique way of identifying this sugary, carbonated beverage, they’re all taking about the same drink that can cause serious oral health problems. Sodas have become one of the most problematic and significant sources of tooth decay found in the American diet. And the beverage is affecting the oral health of children and adults alike. Whether you drink diet soda or regular, every brand contains acidic sugars and acid that soften tooth enamel. Soften enamel makes it easier for plaque, a stick biofilm comprised of bacteria and lingering food particles, to wear small groves into the outer surface of your teeth, allowing bacteria to reach the delicate center. This eventually leads to the development of tooth decay and cavities. In some extreme instances, soft tooth enamel, combined with poor oral hygiene habits, can lead to tooth loss. In addition to the acid found in soda, the sugar each bottle contains also presents a serious threat to your oral health. Plaque uses the sugars you eat as fuel to produce harmful substances that slowly eat away at your teeth’s enamel even when healthy. Drinking soda softens your tooth enamel, allowing these plaque substances to cause even more damage than they normally would. It’s not wonder many dentists refer to soda as like battery acid when you consider what the acids and sugars found in the beverage can do to your oral health. If the risks soda carried for your oral health wasn’t bad enough, a new study suggests that certain brands of the beverage contain chemicals that potentially cause cancer. According to a study conducted by the consumer advocate magazine Consumer Reports, Pepsi One contains higher levels of a chemical that could potentially cause cancer than any other brand of soft drink. Researchers examined the levels of a chemical referred to as 4-methylimidazole, which is used as an artificial caramel coloring agent it sodas, various brands of soft drinks contained. Currently, no federal limits exist that limit the use of the chemical, but California law requires warning labels on any product that could potentially exposure consumers to more than 29 micrograms of the chemical a day, according to the LA Times. Researchers at Consumer Reports discovered that a 12-ounce can of Pepsi One purchased in California contained up to 43.5 micrograms of the chemical 4-methylimidazole, and that a non-alcoholic beverage called Malta Goya contain upwards of 352 micrograms of the chemical. Comparatively, cans of Dr. Pepper and Coke that were tested contained approximately 10 and 4 micrograms of the chemical, respectively, according to researchers. While researchers point out that an individual would need to consume over 1,000 cans a day to reach the levels found to cause cancer in lab mice, this latest discovery only further illustrates the increased risk that comes with soda consumption that scientists have only recently started to discover. In recent years, an overwhelming amount of evidence has been discovered showing the long-term effects soda consumption can have on an individual’s health. The results of a 20-year study found that for every 12-ounce can of soda men and woman consumed a day, they gained an extra pound, on average every four years. Another study found that individuals who drank one or more cans of soda a day increased their risk of developing Type 2 diabetes by 26 percent. This risk became even greater for soda drinkers among young adult and Asian populations. Research has shown a direct correlation between Type 2 diabetes and an increased risk of developing gum disease. When left untreated, gum disease can progress into periodontal disease, the leading cause of adult tooth loss in the U.S. Regular soda consumption can even negatively impact an individual’s heart health, as one study found that men who drank at least one can of soda a day had a 20 percent higher risk of suffering and/or dying from a heart attack when compared to men who did not drink soda at all. So the next time you reach for your afternoon soda, keep in mind what that treat could mean for not only your oral health but overall health as well. 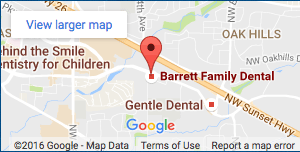 And if you have any other questions, please contact your choice for family dentist in Beaverton: Barrett Family Dental.